Thought Bubble is packed with a mixture of professional established artists and writers, enthusiastic amateurs, cheeky kids who have photocopied their own comic and everything in between. Every single person there is at a different point in their creative career, with different backgrounds, values and passions. But this year, around midday on Saturday, something hit me and I haven’t been able to stop thinking about it since: namely that there’s one unifying motivation within everyone of us that exhibits at Thought Bubble (and beyond) – and it’s actually an incredibly powerful force. It’s not Money. 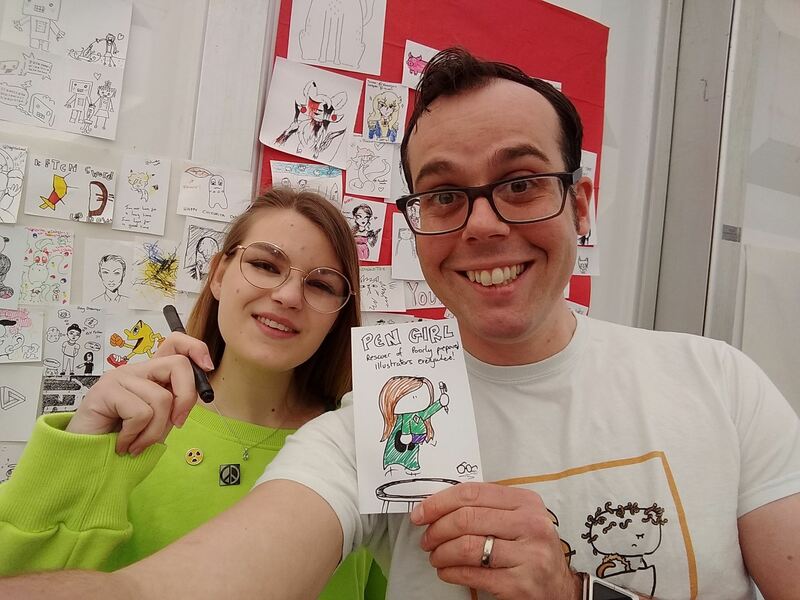 It’s fair to say that just about every exhibitor at Thought Bubble would love to ‘hit the jackpot’ and be the next Stan Lee or Julia Donaldson. But given that so many people consider the weekend a success if they cover the costs of their table, people are there for the cold hard moolah. It’s not Prestige. Being told your work is wonderful and that you’re an inspiration is lovely. Unless there’s a fire, and then trying to fit out of a fire exit with a head that’s too big to fit through the doors becomes a bit of a problem. But given social awkwardness and agoraphobia are pretty common amongst the creative crowd, being put on a pedestal and told you’re a figurehead within your industry is actually a pretty terrifying concept for most exhibitors. It’s not The Accent. If you want to hear proper Yorkshire, come visit us in Hull. It’s the Connection. Over the weekend I lost count of the number of times people said “my kid loves your book. I have to read it every night.” (Though to be honest, that may well say more about my poor counting skills than it does about how many books I’ve actually sold.) Hearing something like that feels like you’re being hugged by a highly trained and extra-fluffy panda. And it’s not to do with the Prestige thing mentioned earlier. There’s an important distinction: Prestige is about fame, status and all that malarkey. But just knowing that you created something and that it speaks to someone else – that they love it – that they feel an affinity with it – and that your values and passion is shared with them is a spectacular feeling. And the more I spoke to the other exhibitors at Thought Bubble, the more I realised that is what drives every single one of us. It’s wonderful. *And also, yay: I managed to die in a way that also reminds people how much of a complete tool the former editor of the News of the World is.